Peach Mango Float Recipe is a Filipino dessert that has a beautiful layering of graham crackers and smooth Vanilla Whipped Cream with layers of Mangoes and Peaches. This dessert also has a hint of sweetened condensed milk, decorated with sliced mango, cherries and mint leaves on top. This Filipino dessert is so easy to make because of its simple procedure, and its ingredients can easily be found in your nearby supermarket baking section aisle. Peaches and Mangoes (Top 10 Health Benefits of Mango) have many health benefits such as dietary fiber, lots of vitamins, including vitamin C, vitamin A, vitamin E, and niacin. These two fruits has also lots of minerals, such as potassium, manganese, phosphorous and many more. Peach Mango Float is a nutritious fruity frozen dessert and deliciously sweet that will surely satisfy your sweet tooth. 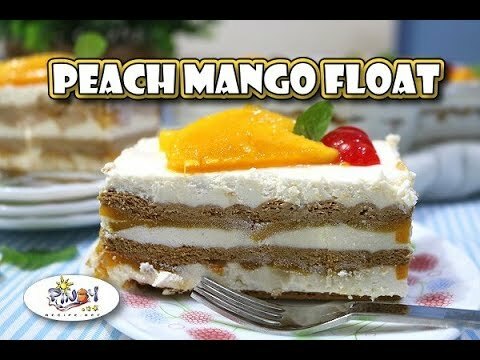 Learn the easy Peach Mango Float Recipe below. Peach Mango Graham Float Recipe is a three layer graham crackers, filled with sweet slices of peaches and mangoes, vanilla flavored whipped cream with sweetened condensed milk and top with cherry and fresh mint leaves. In this recipe all we need is to prepare our sliced Peaches and Mangoes for filling and toppings. Whip the Frosty Whip Cream Powder with cold water, all-purpose cream and sweetened condensed milk. Add in chilled all-purpose cream, sweetened condensed milk, vanilla extract then, mix until well combine. First you have to arrange graham crackers in your baking dish. Lay the crackers flat and even until you cover the whole bottom of the pan. Pour 1 part of the vanilla cream mixture on top and spread evenly and arrange slices of peaches and Mangoes. Place another layer of graham crackers, followed by vanilla cream and arrange another slices of peaches and mangoes and repeat process for the last time, ending with a cream. Decorate it with reserved mango slices on top and I added some cherry and mint leaves on to for a fresh look . Peach Mango Float Recipe is a delicious Filipino dessert and the ingredients can easily be found in the baking section of any supermarket. my kids loveeeeet… thank for this recipe! this totally awesome and delectable! We made it last weekend and the kids loved it so much!